The Hotel Cisar Ferdinand is perfectly located for both business and leisure guests to Loket. The Hotel Cisar Ferdinand boasts a convenient location with modern amenities in every guestroom and superb service. Each guestroom is tastefully appointed with non smoking rooms, television, shower, satellite/cable TV.Guests staying at this Loket accommodation can enjoy a wide range of hotel facilities such as elevator, meeting facilities , restaurant, disabled facilities, valet parking, pets allowed. To unwind, guests can enjoy the leisure facilities provided on the hotel's property, including jacuzzi, sauna. 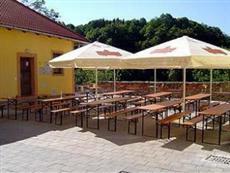 Along with its convenient location in Loket, the hotel also offers a wide range of services and facilities to the guests. To proceed with your booking at the Hotel Cisar Ferdinand, simply choose your travel dates and fill in our secure online booking form.